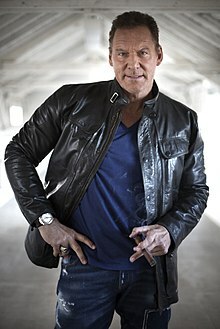 Ralf Rudolf Moeller (born 12 January 1959) is a German actor and former competitive bodybuilder. He is known for his roles of Brick Bardo in Cyborg, Kjartan in The Viking Sagas, the title character in the television show Conan the Adventurer, Hagen in Gladiator, Thorak in The Scorpion King and Ulfar in Pathfinder. He began bodybuilding at age 17 and was the German Champion by 1984. He competed in the 1988 Mr. Olympia alongside Lee Haney, Shawn Ray and others. He is one of the tallest bodybuilding champions to date standing at 1.97 m (6 ft 6 in), weighing 131 kilos (288 lbs) in 1988. Möller began a film career in 1989 with the film Cyborg. In 1992, he appeared in Universal Soldier with Dolph Lundgren and Jean-Claude Van Damme. In 1993 he played the villain Brakus opposite Phillip Rhee and Eric Roberts in Best of the Best 2. His two biggest mainstream film roles to date are Ridley Scott's Gladiator, and 2002's The Scorpion King. Besides these two movies, he has played the leading character in The Viking Sagas, and also played Conan the Barbarian in the TV-series Conan. The show aired in 1997–1998, and the premise was that Conan, accompanied by his three sidekicks, was chosen by the god Crom to fight and vanquish the evil Hissah Zul and to become king. Also, in both The Bad Pack (1997) and Gladiator (2000), Möller appeared alongside fellow bodybuilder Sven-Ole Thorsen. In 2003, he also made a cameo appearance in the music video of Maria (I Like it Loud), by Scooter, a German techno music band. He went on to appear in El padrino (2004), sequel to The Bad Pack, once again playing Special Agent Kurt Mayers. He also played Hammacher in the 2006 film Beerfest. ^ Cohen, David S. (13 October 2009). Screen Plays: How 25 Screenplays Made It to a Theater Near You--for Better or Worse. Harper Collins. p. 18. ISBN 9780061843167. ^ Ebert, Roger (2 December 2002). Roger Ebert's Movie Yearbook 2003. Andrews McMeel Publishing. p. 529. ISBN 9780740726910. ^ Kane, Joe (2000). The Phantom of the Movies' Videoscope: The Ultimate Guide to the Latest, Greatest, and Weirdest Genre Videos. Three Rivers Press. p. 128. ISBN 9780812931495. ^ Smith, Gary Allen (3 September 2015). Epic Films: Casts, Credits and Commentary on More Than 350 Historical Spectacle Movies (2nd ed.). McFarland Publishing. p. 94. ISBN 9781476604183. ^ "New Trailer for 'Sabotage' Starring Arnold Schwarzenegger". Latino Review. Archived from the original on 2014-01-13. ^ "Ralf Moeller 'Gladiator' 'We Just Finished 'Ten' With Arnold Schwarzenegger".